Well a gloomy day and not a whole lot of rain but glad we did get some. 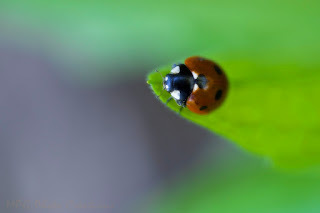 I was able to capture this Ladybug last week on a leaf of one of the flowers in my garden though I can't remember which one right now. I love the dreamy quality because of everything being out of focus except the ladybug. I actually came up with a title for this one, Out of the Deep.